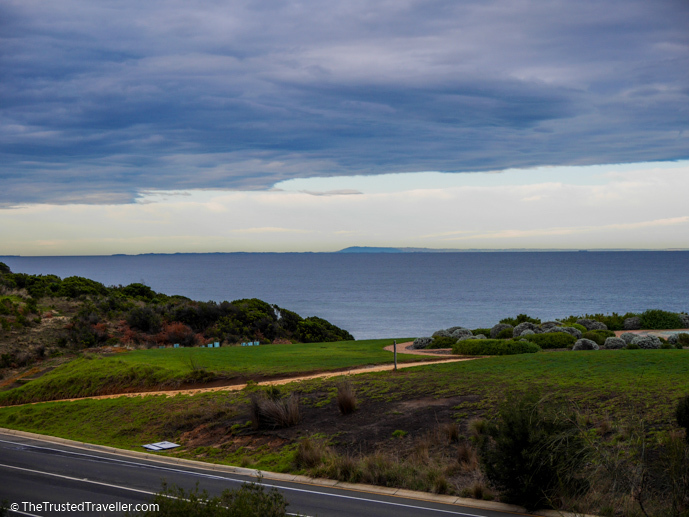 The famous Surf Coast of Victoria makes an excellent short break or stopping point to begin the spectacular Great Ocean Road. It’s an area perfect for relaxation if you need a break from everyday life, or adventure if you prefer your holidays more action packed. Regardless of what you’ll be up to, having a great place to stay will help you achieve your holiday goals and ensure your time on the Surf Coast is a memorable one. 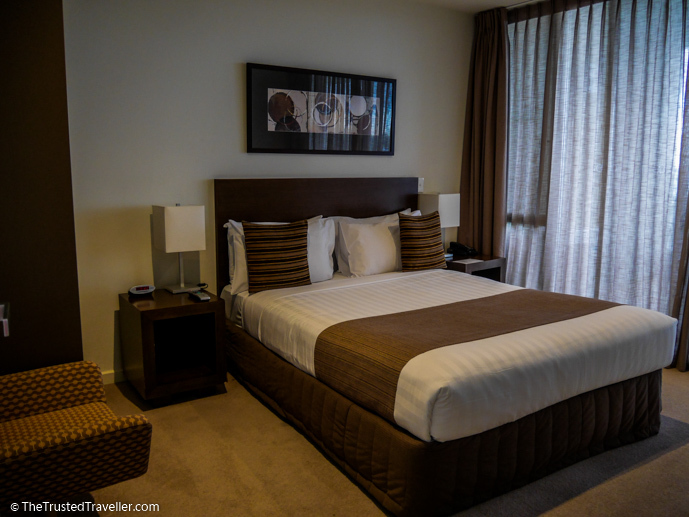 We recently stayed at the Wyndham Resort Torquay and want to tell you why we think it’s the perfect place to stay in the area. 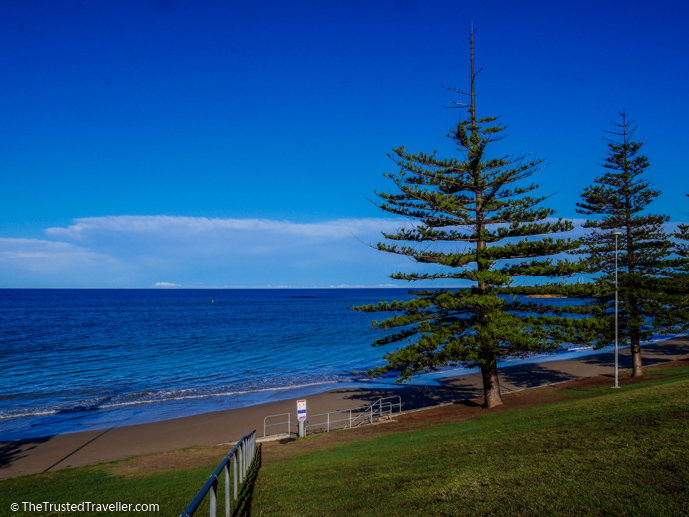 Torquay is the gateway to the Surf Coast and is an easy one and a half hour drive from the centre of Melbourne. It is the first town you come to after leaving Geelong and it is absolute ocean front. The town is most famous for its waves and attracts board riders from all over the world who want to ride its pumping surf. 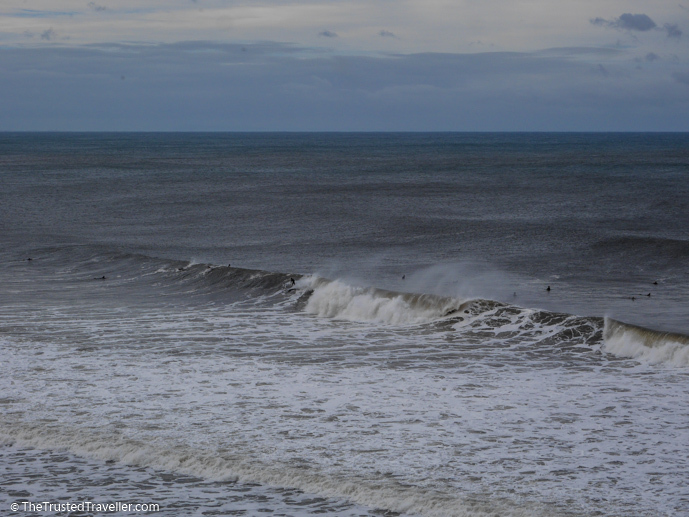 These waves are world class and home to one of the pro Surfing Leagues biggest calendar events of the year, the Rip Curl Pro, held each year at Bells Beach around later March, early April. But if surfing isn’t your thing, we assure you there is plenty more to keep you busy. 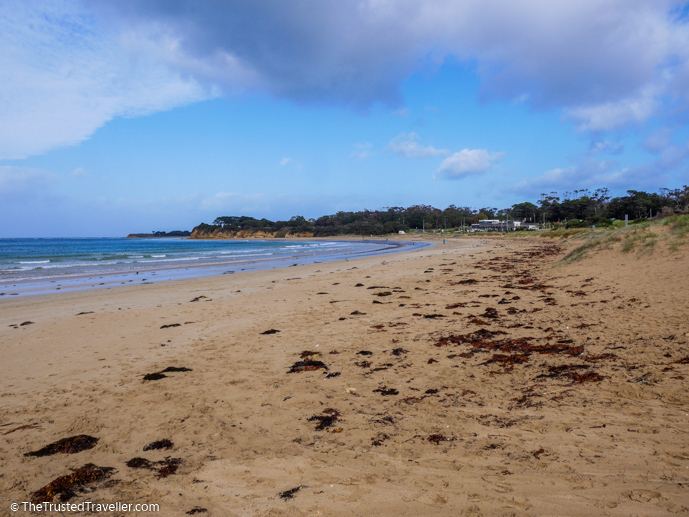 There’s amazing coastal walks, beaches that are a little more family friendly with smaller waves, a world class food and wine region nearby, and one of the world’s greatest drives, The Great Ocean Road, is right on its doorstep. 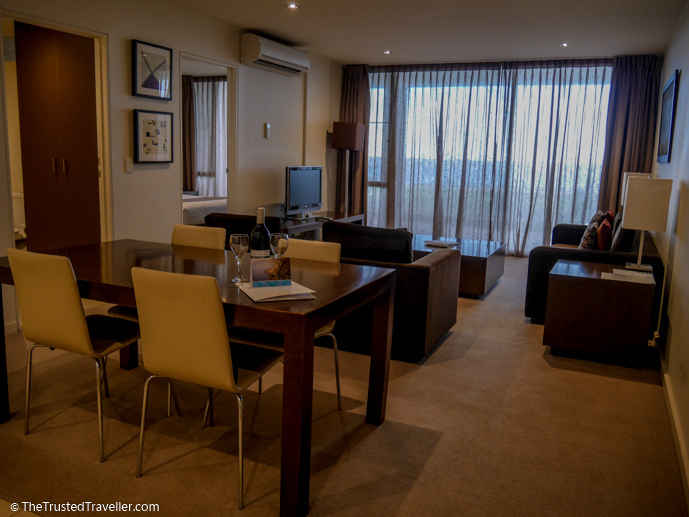 Why Choose the Wyndham Resort Torquay? First impressions are always important and the folks at the Wyndham Resort Torquay seem to follow this notion too. It started even before we arrived with a courtesy call from one of the customer service staff the day before to confirm our reservation and ask if there was anything we needed in the lead up to our stay. Then on arrival we were greeted with a big smile and friendly welcome from the check-in staff at the front desk. Both ladies working the day we arrived said hi as we entered the foyer and the lady who checked us in was lovely, making pleasant small talk, asking us about our journey to get there and giving us a map on which she showed us the best nearby restaurants, facilities and things to do. The main foyer also has a very inviting feel to it with big windows that make the most of the ocean views and comfortable seating perfect for short waits during busy times. Choice of accommodation styles is very important to us when travelling. You see we don’t fit one style mould. We’re not budget travellers, nor are we luxury travellers, or anything in between. We are everything travellers who choose accommodation that suits the needs of each individual trip or stay. 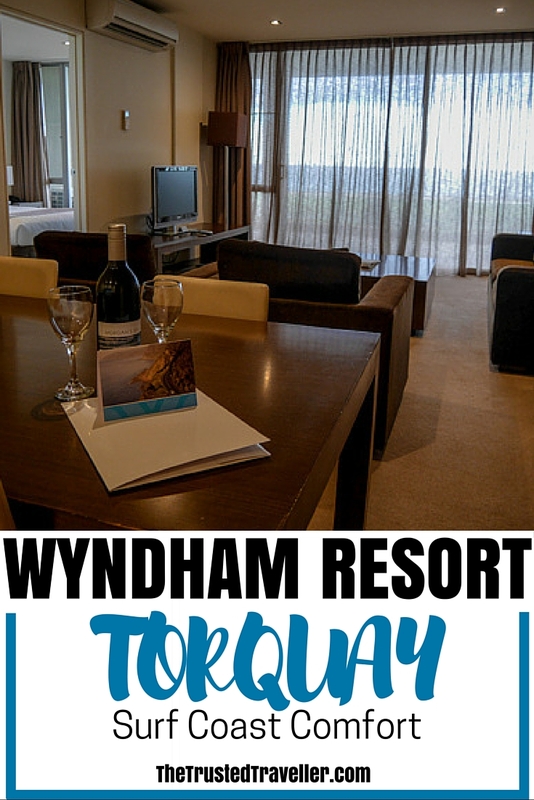 The Wyndham Resort Torquay offers two styles of accommodation, hotel rooms and apartments, both are very well appointed and of a high standard. This gives you the opportunity to choose which style best suits the needs of your trip. For example, if you plan to be eating out mostly during your stay then a hotel room would be a good choice for you. But if you’re more interested in self-catering, then we recommend an apartment which gives you the choice to cook some or all of your meals with the included facilities. They also offer interconnecting rooms which are perfect for families or people travelling together, giving you more space for everyone to enjoy. Sometimes comfort is sacrificed for modern design but at the Wyndham Resort Torquay they seem to have struck the perfect balance. Starting in the foyer where the furnishings are modern yet relaxed and comfortable. This theme moves to the rooms which are spacious, have a modern feel to them but don’t sacrifice on the comfort with plenty of soft furnishings. 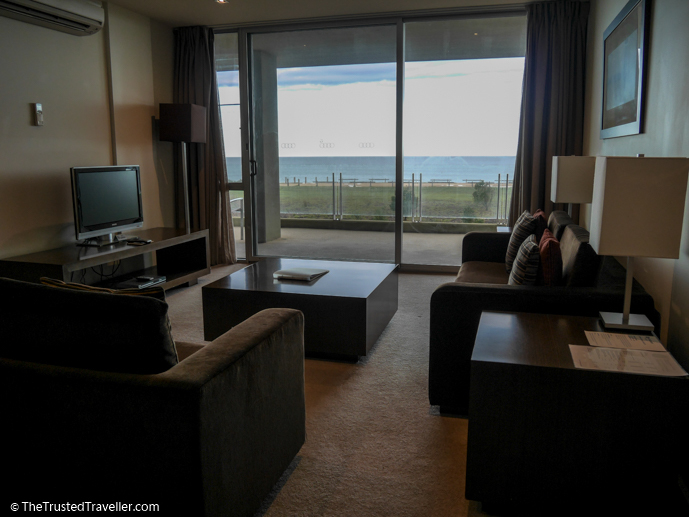 Our one bedroom ocean view apartment was fully equipped with the kitchen, dining and lounge area open plan and opening up to a large balcony with the bedroom and bathroom off the side. 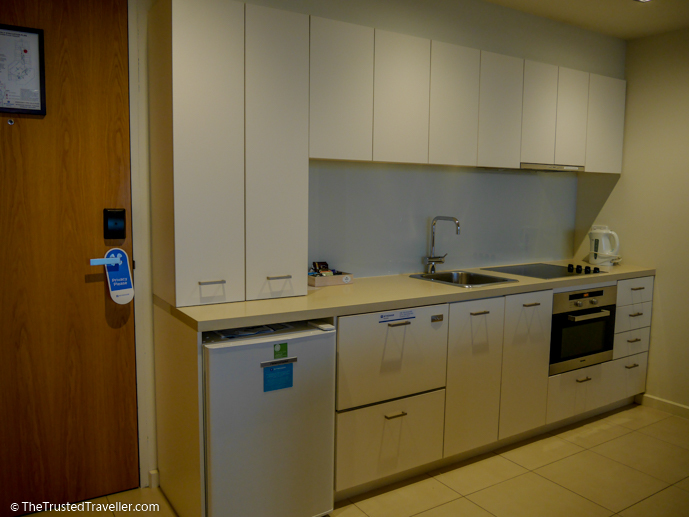 The kitchen comes with a small fridge, dishwasher, full sized stove top and oven. All appliances are in near new condition and we used everything so we know that everything worked well. Then in the cupboards is everything you need to cook a decent meal and then some. The dining and lounge area is comfortable and offers lots of space with a four seater dining setting, a long 2-3 seater couch and two arm chairs. There’s a big screen TV that gives you access to selected Foxtel channels and pay-per-view movies. A comfy bed in the large bedroom that also have a small arm chair, wardrobe and another TV which was perfect for a lazy morning in bed. 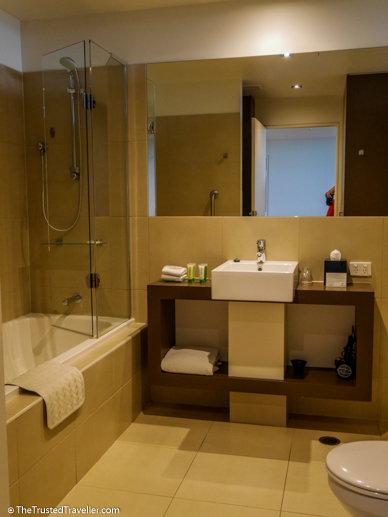 The spacious theme continues in the bathroom with a combine bath/shower, long basin area and a hidden laundry with washer and dryer, handy for longer stays. There’s a long list of facilities available to guests that you would expect from a property like this and each one is designed to help you relax and enjoy your stay in Torquay. First up, they have two dining choices for you. 100 The Esplanade Restaurant & Bar serves modern Australian food made from locally sourced ingredients and panoramic ocean views. Then there is The Pool Bar (open seasonally) which serves drinks (including cocktails) and light meals throughout the day. 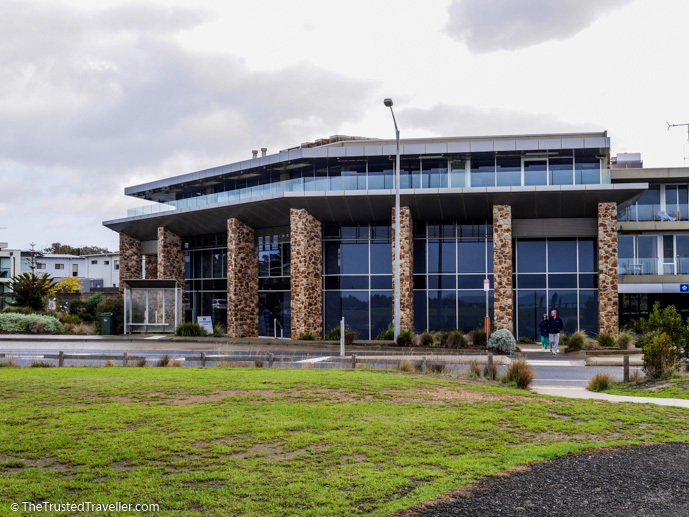 And speaking of pools, the Wyndham Resort Torquay has a massive resort style pool in the centre of the building which has lots of seating for you to relax the day away. For those who relax through exercise there’s a fully equipped gym, indoor heated lap pool and a tennis court. And then after all that exercise or adventurous outdoor activities you can come back to the resort and enjoy the facilities of Endota Spa. They offer all sorts of treatments from massages to facials and everything in between. Finally we want to tell you about the location. While it’s not right in the heart of town, we think this is a good thing. One it makes it quieter and two it helps you disconnect and relax, enjoying the whole resort experience more. And if you do need to head into town it’s just a few minutes’ drive or an easy 20 minute walk away. But just because it’s not right in town doesn’t mean it’s not near anything. Right across the street, just seconds walk, is the beach and access to the coastal walking track. Really everything you would need for a relaxing coastal break is just right on your doorstep. 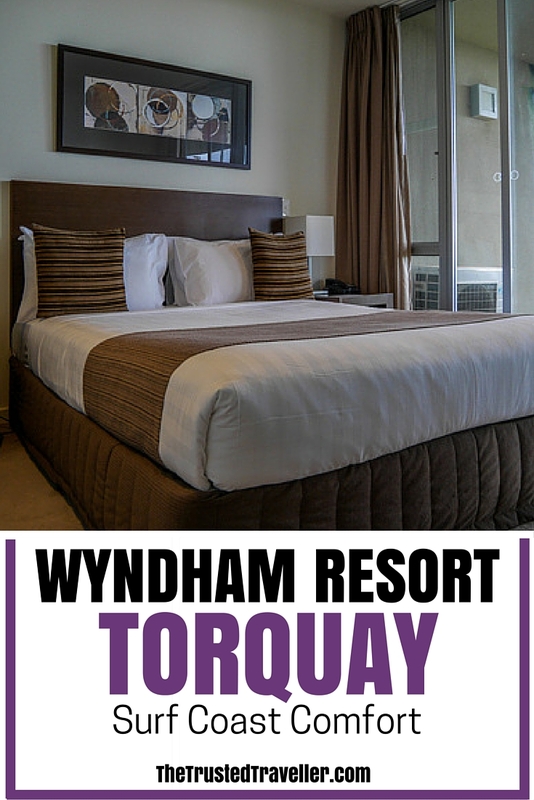 The Wyndham Resort Torquay offers modern luxury hotel rooms and one bedroom apartments designed for comfort and function. Most rooms have balcony’s with either pool, garden or ocean views. 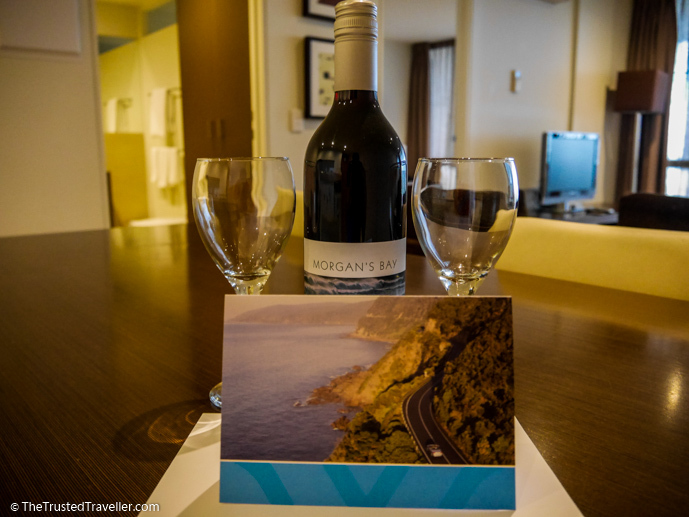 The resort is located in Torquay on the waterfront with beach access just steps away. It is an easy one and a half hour drive from the centre of Melbourne or Tullamarine Airport and just 40 minutes from Avalon Airport. Car hire is available at either airport or check regional bus timetables to get you there. We would like to thank the team at Wyndham Resort Torquay for hosting us and making us feel welcome. As always, all opinions expressed in this review are our own and were not influenced in any way by receiving a discounted stay. Looks like a wonderful place to stay. I know I’d like the coastal walk. I can live nicely without towns for a week. Oh it was lovely Barbara. Thanks for stopping by.